At IFA 2010 Sony was displaying it's latest attempt to take a slice of the pocket-cam market. The Sony Bloggie Touch or MHS-TS20K is the latest generation of Sony's pocket Flip-rivalling camcorder and the first to feature a touchscreen. It's hard to believe it's only been about a year since the original Bloggie - the gaudy orange MHS-PM1 landed and this is a world away from that first effort. Capturing full HD movies and with a f2.8 lens the TS20K is far more contemporary, sophisticated and attractive. 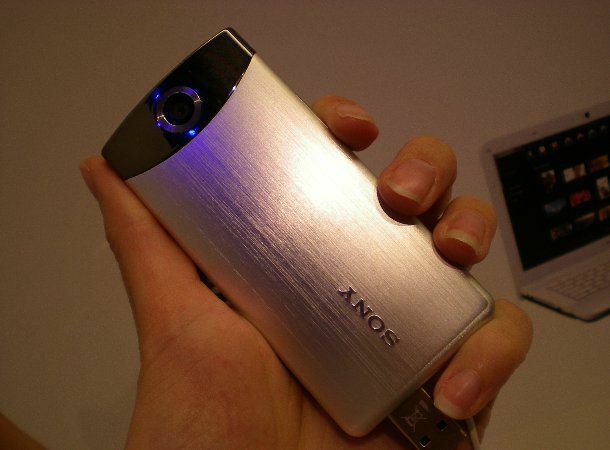 It doesn't even look like a camcorder - in fact we'd say this has more in common with a Sony Walkman. Available in silver (clearly a nod to the Flip Mino HD), pink (which is far classier than you'd imagine) and black, the brushed aluminium finish makes it feel like a high-quality, durable product, but still lightweight at 142g. Measuring 15.2mm deep, it's slimmer than the Sony Bloggie PM5 and will easily fit into a jean or shirt pocket. Starting up quickly, Sony's kept controls to the minimum. One press of the large record button and you can start videoing, shooting 1920x1080 movies at 30fps. Controls along the top include On/Off and still-image record for capturing 12.8-megapixel images. Swap between landscape and portrait mode and the screen responds quickly. Transferring video and images couldn't be simpler, thanks to the flip-out USB port located in the bottom. You also get an HDMI port for viewing video on a high-definition TV, while Sony still supplies a 360 Video Lens, so you can capture video panoramas. One change we're not keen on is the removal of the memory card slot. Instead the TS20K has 8GB internal storage, which captures four hours of 1280x720p video (less for full HD). We also noticed the MHS-TS20K gets fairly hot quite quickly, although the unit we played with had been used on Sony's stand for long periods. Available in October, first impressions of the Bloggie Touch are pleasing. We love the sleek design, it's easy to use and the touchscreen responds well, lets hope video quality is as impressive.